The sixteen-time grand slam champion was slated to face fellow Spaniard Feliciano Lopez in the opening round of the tournament on Wednesday. Rafael Nadal has pulled out of the Mexican Open following a right hip injury after undergoing a few test which led him to miss the ATP tournament. The former World No.1, who has been overtaken by arch-rival Roger Federer, was supposed to play starting from February 28. The same injury also forced Nadal to withdraw from the Australian Open. "Tough one, of course. Yesterday in the last practice I felt something... 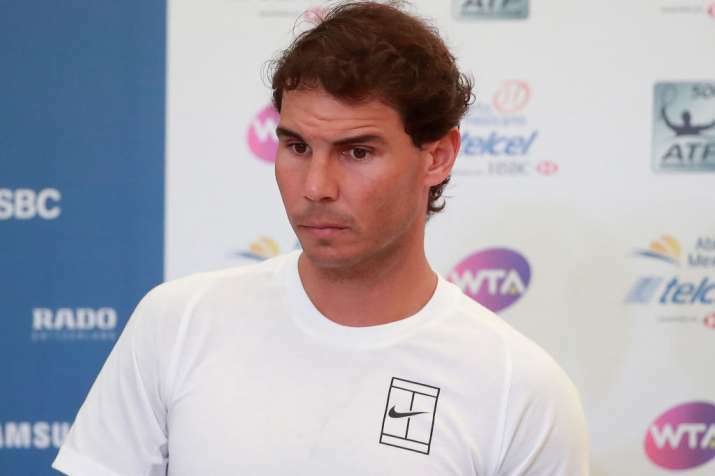 I went to the hospital this morning to check it, to do an MRI and I still have some liquid there, so I need to keep doing tests to know what exactly is going on," said Nadal to ATP. He added, "The spot is really similar to Australia, so I need to be sure about what's going on the next couple of days, and then we're going to work hard to try to recover as soon as possible." Nadal has not played a match since retiring from a match in Melbourne on January 23.